It is hard to imagine what the Christian story would be without St Luke. We know next to nothing of him, his origins, life and ministry. From Paul’s letter to the Colossians we have the rumour that Luke was a physician; from the early Church, from about the 8C there is the attribution that Luke was a painter of icons; there is a wealth of legend, rumour and disputed history. That said, I cannot imagine the Christian story without Luke – it would be so much the poorer. I say that because I see Luke as the most gifted writer behind the gospels. Luke is exceptional as a story-teller, both in the arrangement of his materials and in the stories he gives us. Consider this: Luke gives us more parables of Jesus than any other gospeller and, though Jesus is the source for his parables, Luke tells them with exceptional power and clarity. There are eleven parables found only in his gospel. The best known examples of these unique parables would be that of the Good Samaritan and the parable of the Prodigal Son. These are powerful and memorable stories – and it is hard to imagine our faith without them. But stories, even the most powerful, hold power by the structure – the narrative frame that contains them, and gives them a context: which I think brings us to the greater context of Luke’s work as an evangelist. In the big picture Luke is not just the writer of the gospel but also of Acts: in fact the two books are really one book and we should be speaking of it as Luke-Acts, as most scholars now tend to do. The broad arrangement of the composite work is simple: the first section, the gospel, is geographically focussed on a movement toward Jerusalem; the second section, Acts, is all about the movement of faith out of Jerusalem and into the Gentile world. Luke has also enjoyed something of a reputation as a historian. The opening verses of both the Gospel and Acts remind us that he has researched his materials and is seeking to give his reader (Theophilus) an orderly story of Jesus and of the apostles. Certainly the information in Acts seems generally to tally with what we know from Paul’s epistles of the early church’s mission to the Gentiles. However Luke is not writing academic history but he is telling a story about faith and the faith-orientation of Luke-Acts is primary and controls the story. 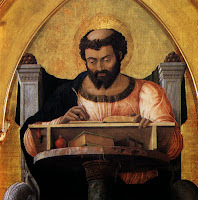 That said, without Luke’s work in Acts, much of the story of the early church would be much harder to piece together. Fortuitously the passage of Luke set as our gospel for this morning has material found only in Luke. Nowhere else are the seventy evangelists mentioned: this sending out of the seventy marks Luke’s particular interest in connecting the person of Jesus and his ministry with the whole history of Israel as God’s people. The number seventy is a strong reminder of how Moses appointed seventy elders to share his work with the people (Numbers 12); but this sense of continuity with God’s purpose through history is also accompanied by an ‘edginess’ and a sense of threat. As Jesus and the disciples are now to go through Samaria they are entering unfriendly and unreceptive territory. Facing them is the whole history of the ancestral antipathy between Judeans and Samaritans, based on matters that seem now so utterly remote from our comprehension: the rivalry between the shrines of Mt Gerezim and Mt Zion; a whole range of disputes on such matters as the right way to read the sacred books; messianism; and above all, who was a real Israelite! For that reason the disciples need to travel light; they need to be able to move quickly when necessary. They need to keep a low profile in enemy territory – ‘Don’t greet anyone on the road’. They are to stay put in those homes where they are welcomed, that might be a caution for personal safety but elsewhere gadding about house to house has been associated with charlatans trying to attract attention and gain favour. They are truly being sent out as ‘lambs among wolves’ as they prepare the way for Jesus as he makes his way toward Jerusalem. Which may be where Luke’s work, Luke-Acts, now touches us: it reaches across the millennia and reminds us that we too are caught up in the great work of the Kingdom of God. When Jesus says “See, I am sending you out like lambs into the midst of wolves,” we may not quite see how that applies to us. But I suggest that the call to sacrifice, to a difficult innocence, to putting on of the mind of Christ, is as great and as urgent as ever – and the wolves are as fierce as ever but more subtle – lurking in the discarnate spirits of the internet, in the technology that binds the human spirit, and in the neo-liberal idolatry of the market.